Showing all 85 items matching your search criteria. 118. A German 17th century parcel-gilt silver tankard, mark of Peter Ohr I (Öhr), Hamburg (1649-1662). 119. 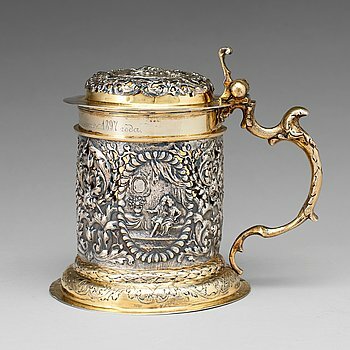 A German 17th century parcel-gilt silver tankard, marks of Israel Thelott, Augsburg (1654-1696). 120. A Swedish late 17th century parcel-gilt filigree miniature tankard, mark Johan Fridrich Straub, Karlstad (1674-1713). 121. A Swedish late Baroque 18th century parcel-gilt silver tankard, mark of Niclas Fernlöf, Karlstad 1742. 122. 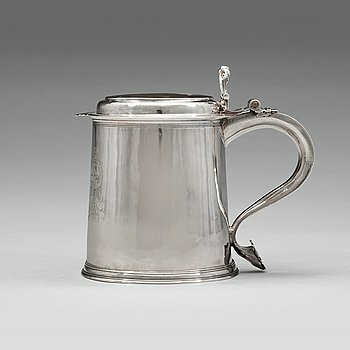 An English 17th century silver tankard, makers mark M, London 1672. 123. An English 17th century silver tankard, mark of John Jackson, London 1689. 124. 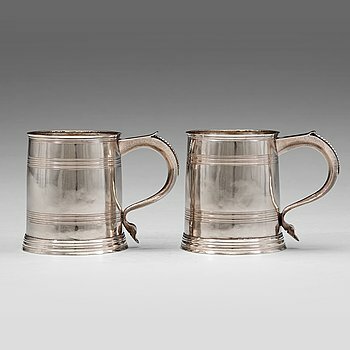 A pair of English early 18th century silver muggs, mark of John Cory, London 1704. 125. 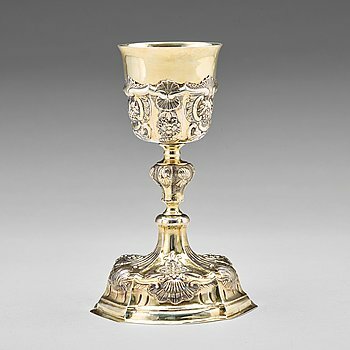 An Austrian mid 18th century silverl-gilt communion cup, unidentified makers mark, later standard mark. 126. A Swedish 18th century silver sweetmeat bowl, mark of Petter Åkerman, Stockholm 1769. 128. A Swedish silver parcel-gilt brandy-bowl, mark of Olof Grubb Hudiksvall 1800. 129. A Swedish 18th century silver dish, mark of Jonas Thomasson Ronander, Stockholm 1753. 130. A Swedish 18th century rococo silver coffee-pot, maker's mark of Jacob Lampa, Stockholm 1770. 131. A Swedish 18th century parcel-gilt silver cream-jug, marks of Lars Boye Stockholm 1772. 132. A Swedish 18th century parcel-gilt silver cream-jug, mark of Jonas Thomasson Ronander, Stockholm 1768. 133. A German 18th century silver Rococo sugar-casket, mark of Johann Gottfried Hildebrandt, Berlin ca 1740-60 (1743-1778). 134. 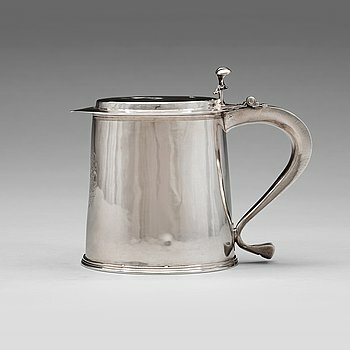 A Swedish 18th century silver coffee-pot, mark of Johan Wennerwall, Gothenburg 1759. 135. A Swedish 18th century parcel-gilt cream-jug, mark of Sven Nyberg Varberg 1785. 136. A Swedish 18th century silver coffee-pot, mark of Claes Ekman, Kristinehamn 1774. 137. A Swedish late 18th century silver coffee-pot, mark of J. Henrik Frodell, Stockholm 1797. 138. A Swedish Gustavian 18th century silver coffee-pot, mark of Pehr Zethelius, Stockholm 1807. 139. 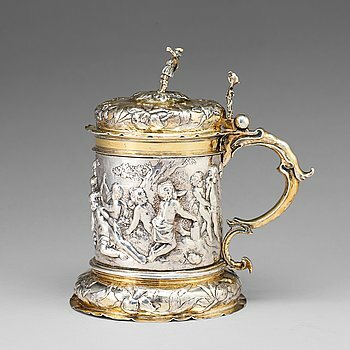 A Swedish 18th century silver coffee-pot, mark of Johan Fredrik Wildt, Stockholm 1790. 140. 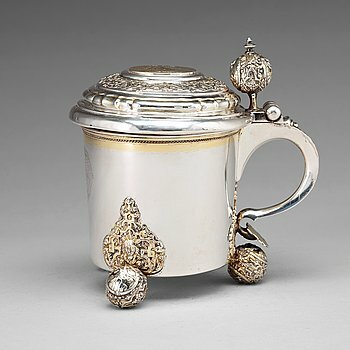 A Swedish 18th century silver cofee-pot, mark of Petter Eneroth, Stockholm 1798. 141. A Swedish empire silver coffeepot mark of Anders Lundquist, Stockholm 1817. 142. A Swedish 18th century Gustavian silver sugar-casket, mark of Pehr Zethelius, Stockholm 1797. 142A. A PAIR OF SWEDISH SILVER SUGAR-BOWLS AND COVERS, Makers mark of Jacob Lampa, Stockholm 1778. 143. A pair of Swedish late 18th century silver sugar bowls and covers, mark of Pehr Zethelius, Stockholm 1780 and 1781. 144. A pair of Swedish late 18th century parcel-gilt silver salt-cellars, mark of Mikael Nyberg, Stockholm 1795. 145. A Swedish 17th century parcel-gilt silver beaker, mark of Erik Bengtsson Starin, Stockholm 1695. 146. A Swedish 18th century parcel-gilt silver beaker, mark of Gustaf Stafhell, Stockholm 1742. 147. A Swedish 18th century parcel-gilt silver beaker, marks of Lorens Stabeus, Stockholm 1755. 148. A Swedish 18th century parcel-gilt silver beaker, marks of Daniel Lundström Stockholm 1784. 149. A matched pair of English 18th century silver candlesticks, mark of Paul de Lamerie and David Willaume, London 1748. 150. A pair of Swedish 18th century silver candlesticks, mark of Lucas von der Hagen, Stockholm 1728. 151. A pair of 18th century silver candlesticks, maker's mark of Swante Striedbeck (Stralsund 1763-1776). 152. A pair of Swedish silver candlesticks, mark of Stephan Halling, Örebro 1775. 152A. A pair of Swedish 18th century silver candlesticks, Anders Schotte, Uddevalla. 153. A pair of Swedish 18th century silver candleabra, mark of Pehr Zethelius, Stockholm 1799. 154. A pair of Swedish 18th century silver candlesticks, Stephan Westerstråhle, Stockholm 1793, one nozzle J E Torsk 1895. 156. A pair of late Gustavian candlesticks, mark of Olof Hellbom, Stockholm 1798. 157. A pair Swedish late 18th century silver candelsticks, mark of Pehr Zethelius, Stockholm 1796. 158. A pair of Swedish 18th century silver chamber-candlesticks, mark of Isak Sauter, Stockholm 1772. 159. A pair of Swedish 18th century silver chamber-candlesticks, mark of Lorenz Vick, Ulricehamn 1773. 160. A Swedish late 18th century cruet-set, mark of Pehr Zethelius, Stockholm 1799. 161. A baroque parcel-gilt silver box, unmarked possibly Swedish ca 1700. 162. A Scandinavian 16th century silver-gilt spoon, unmarked. 163. A silver-gilt spoon, unidentified makers mark, possibly Swedish, late 16th century. 164. A Swedish 17th century silver-gilt spoon, mark of an unidentified maker in Stockholm (1623-1653-). 165. A Swedish 17th century silver-gilt spoon, mark of Albrekt Lockert, Stockholm (1623-1653-). 166. A Swedish 17th century silver-gilt spoon, remarked by Johan Nûtzel, Stockholm 1705. 167. A Swedish early 17th century silver-gilt spoon, unmarked. 168. A Swedish 17th century parcel-gilt silver spoon. 169. A Scandinavian 17th century silver-gilt spoon, unidentified makersmark. 170. A Scandinavian early 17th century partially silver-gilt spoon, unidentified marks. 171. A Swedish 17th century silver spoon, unmarked. 172. A Swedish 17th century silver spoon, mark of Anders Larsson, Norrköping (1636-1670). 173. A five piece set of silver-gilt travel-cutlery, unidentifiable makers mark, Paris 1798-1809, in original box. 174. A 18 piece silver-gilt and blue glass dessert-cutlery set, probably Germany 19th century. 175. An English early 19th century silver tureen, mark of Paul Storr, london 1803. 176. 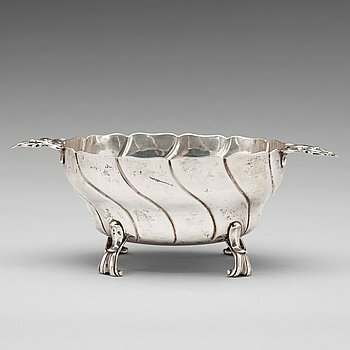 An English early 19th century silver basket, mark of William Allen III, London 1804. 177. An English 18th century silver ink-stand, mark of Garrard's, London 1827. 178. A Tiffany & Co silver and cut glass decanter, circa 1900. 179. A Russian 19th century parcel-gilt silver coffeepot and cream jug, mark of Gustav Lindgren, St Petersburg 1827. 180. A Russian silver bread basket marks of Fedor Frolow, Moscow 1838. 181. A Russian 19th century parcel-gilt silver fruit basket, St. Petersburg 1861. 182. A Russian 19th century parcel-gilt silver beaker and cover, Moscow 1857. 183. A Russian parcel-gilt silver kovsh, Moscow 1873. 184. A Russian 19th centruy silver tea-glas holder, St. Petersburg 1873. 185. 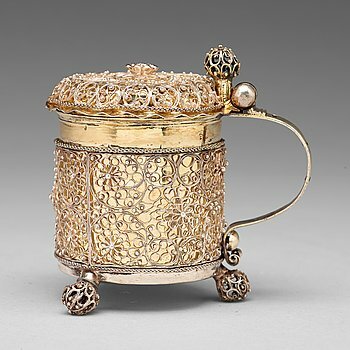 A Russian early 20th parcel-gilt silver and enamel tankard, most certainly, Vasily Agafonov, Moscow 1899-1908. 186. A Russian silver and enamel early 20th century cup, mark of Orest Kurljukow, Moscow 1908-17. 187. A Russian small silver and enamel bowl, mark of Fedor Rückert, Moscow 1899-1908. 188. A FABERGÉ parcel-gilt basket, Moscow 1894. Imperial Warrant and scratched invntory no. 4969. 189. Fabergé, christening cutlery, 5 pieces, silver, Moscow 1899-1908. 190. A Fabergé silver vodka cup, workmaster Mikhail Perkhin, St Petersburg 1908-17. 191. A Swiss late 18th century gold and enamel snuff-box. mark of Guidon, Rémond, Gide et Cie, Geneva. 192. A gold and silver-gilt enamel cigarette case, mark Ivan S Britzin (Brizyn) retail mark Soumin, St Petersburg 1908-1917. 193. A silver jubilee hardstone and silver mantle clock by WA Bolin, Moscow 1912-1017. 194. Henri de Bary, pocket watch, silver, probably late 17th century. 195. A silver pocket watch, Markwick, London probably late 17th century. 196. Johan Khornman(Kornman) pocket watch, silver, probably Austria ca 1700. 197. A rare late 18th Century verge automaton depicting the battle of Arcola, G Masterman, London. 198. Edward Prior, silver pocket watch for the Turkish market , London 1824. 199. Pocket watch, gold, repeating automaton, ca 1820. 200. POCKETWATCH, 55 mm, repeter, skeleton watch.